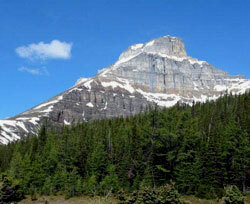 Named for: A huge tower stands immediately north of the peak. It was though to be suggestive of the Eiffel Tower. 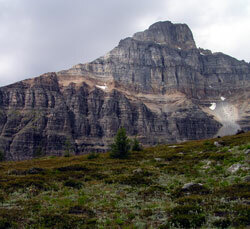 Eiffel Peak lies between the Moraine Lake valley and Paradise Valley. 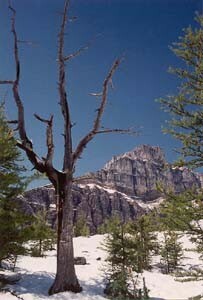 The slopes are gentle on the Moraine Lake side but the cliffs are steep and spectacular on the Paradise Valley side. A 120 metre notch separates the main summit from Eiffel Tower. 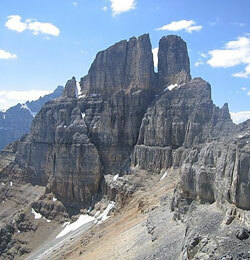 Eiffel Peak can be ascended with little difficulty but Eiffel Tower is a challenge. It was not climbed until 1952 when J.A. Murphy and T.A. 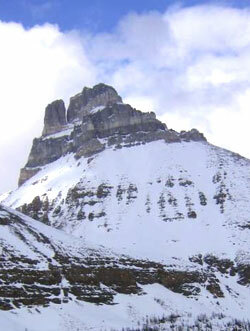 Mutch required nine hours to reach the top from the notch. 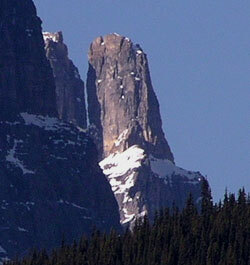 A good, although somewhat disconcerting, viewpoint for both the peak and the tower is the Samson Mall in Lake Louse Village. 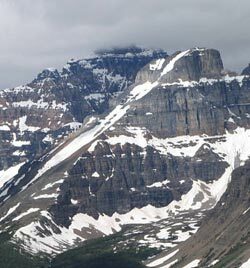 Eiffel Peak, with Eiffel Tower to its right, appears beyond the steep cliffs of Mount Temple.